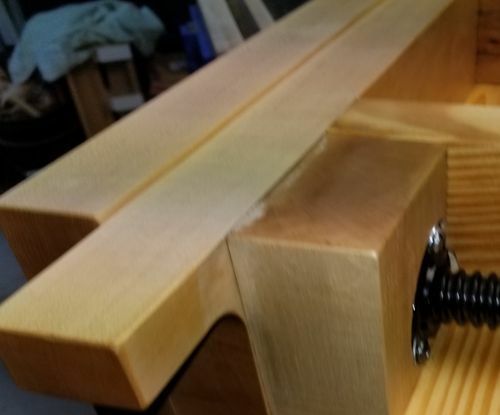 With inspiration from kocgolf and PlanBWoodworks and the many other moxon builds on LJ I have completed a moxon vise, although it may get modified with use. 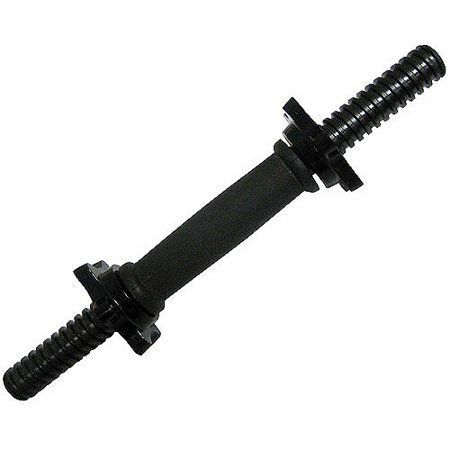 Note: one end of one of the threaded bars had a thicker coating than the other. So I had to sand it some. This was an low cost project. 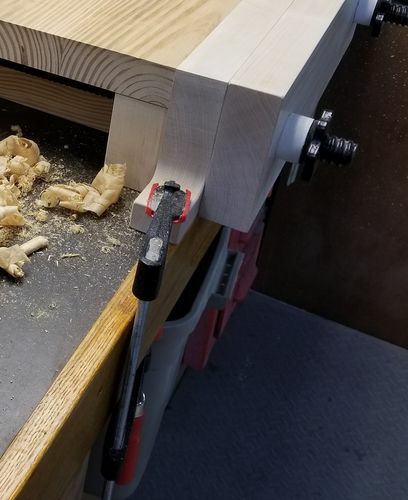 In addition to the dumbbell handles I bought $12 worth of hard maple. For dogs I got a set of 4 Kreg blue plastic ones on Amazon for under $9. 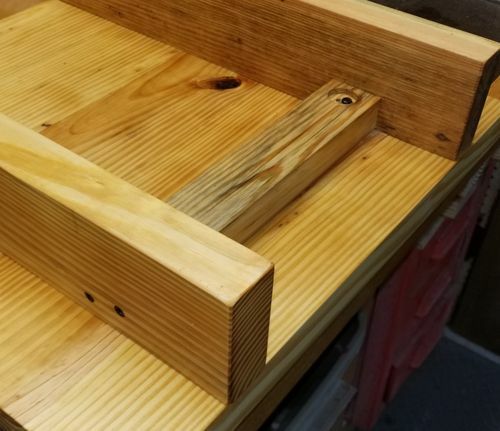 The support rails and top are made from pine recycled from an old bench top 2X10s which cleaned up nicely. 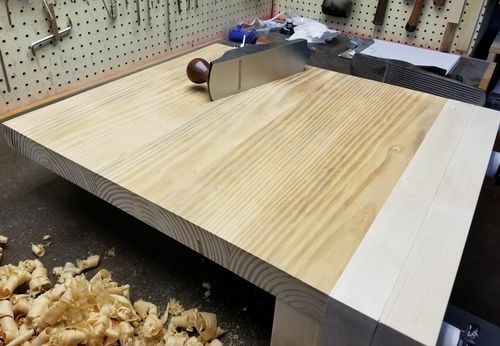 Chops are made from hard maple. My guess is this monster weighs in at over 50 pounds. NIce work. And good choice designing it so the extra threads are hidden inside instead of sticking out the front. 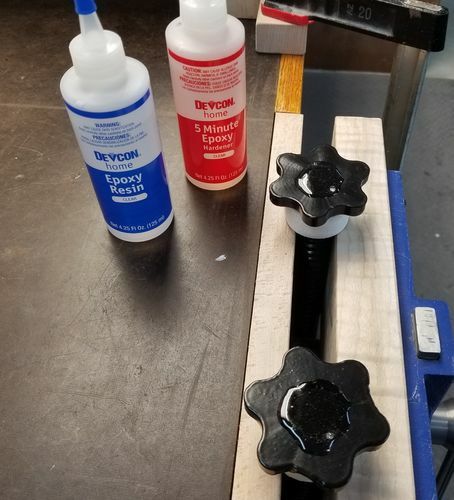 Simple and inexpensive vice. Great work. I have favored this so I can utilize your ides for both myself and perhaps for friends making something similar for them. All great additions! I still need to add blocks to alleviate sagging, but it’s really more of an annoyance than anything. It corrects when tightening. 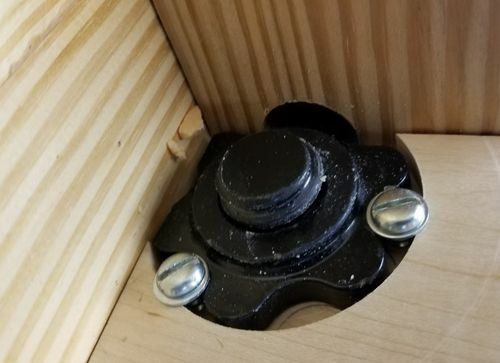 Interesting idea to attach the nuts to the rod. I hadn’t thought of that. I have no idea what the tpi on this thread is, but I was considering adding some sort of different wheel someday. No rush though as the dumb bell start knobs work very very well. Wonderful design and work, thanks for sharing, really clever using the dumbbell screws, might have a few around. Thanks Pete and koc. 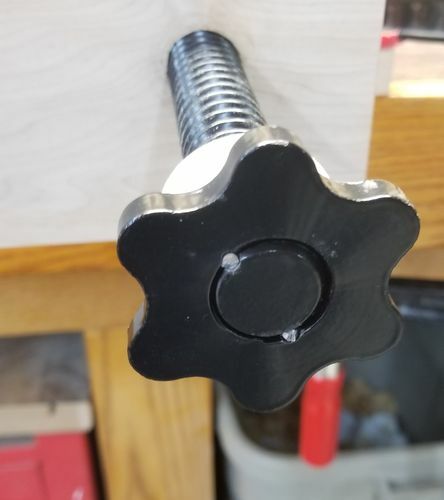 Pete, please note that I got the dumbbell screws idea from koc who got it from PlanBWoodworks. Awesome work! 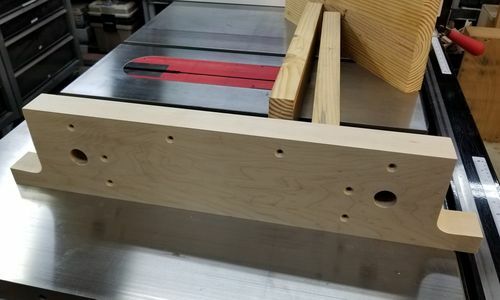 I just sold the bench that I attached my Moxon to, but I removed the Moxon first. I used it so often that I couldn’t let it go. 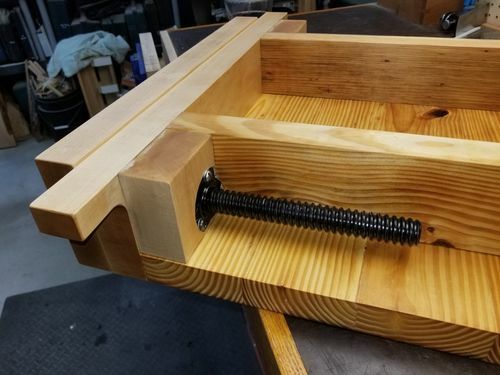 I am going to make some modifications and use it as an add on to my Roubo build. Great job! I hope you find it as useful as I have.